Need housing with special amenities? This service has free tools to help find assisted living, senior housing, and units with a range of amenities. Select an area to search to see a search screen. NOTE: If you are taken directly to search results and do not see a search box, click "Refine or Restart Your Search" at the top of your results to see the search screen. Click the "Accessible" tab to see search filters for accessibility features. 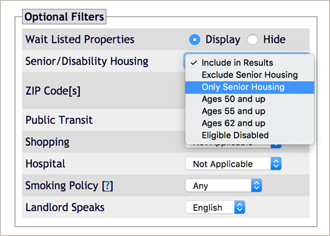 Under "Optional Filters," find menus for senior/disability housing and housing near public transit and medical facilities. 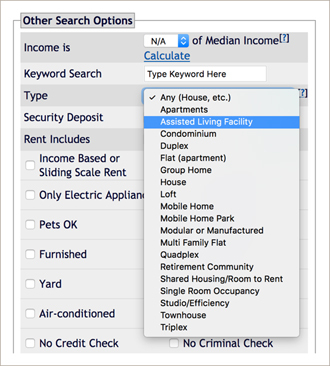 Under "Other Search Options," find "Assisted Living Facility" and other choices such as "Shared Housing/Room to Rent" in the housing "Type" menu. Want to list assisted, senior, or accessible units? It's easy and free to add listings with a broad range of special features and eligibility. Just register or log in to begin listing. Contact us for an innovative solution that can be combined with real-time bed-availability, licensure-database sync, and the support of the compassionate toll-free call center. For free search and listing assistance, call 1-877-428-8844 for (toll free, weekdays, 9 a.m. - 8 p.m. Eastern Time).